Why is it a Great Gift ? : Huggable, lovable, cuddlable - this birthday bear says it in style. Perfect way to wish someone a very happy birthday and a great year ahead. Makes a great birthday gift for kids, teenagers and women. 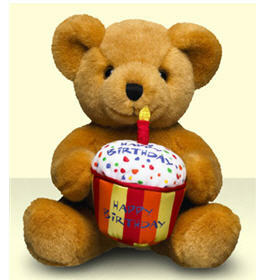 Send an extra special Birthday Message with our Happy Birthday Bear. He holds a special birthday cake with Happy Birthday written on the side and top. So huggable and lovable, our caramel brown bear sits 8 high, and is a great gift to send to celebrate a special day.